With the release of the new short film WEconomics highlighting the vibrant ecosystem of cooperatives in Italy’s Emilia Romagna region—produced by our friends at Moving Images, who also made the excellent worker cooperative documentary Shift Change—we reached out to Vera Zamagni, the cooperative economist featured in the film, to learn more about the cooperative movement in Italy. John Duda, The Next System Project: Despite a long, interesting history and some impressive momentum in recent decades, the experiences of the Italian cooperative sector are much less familiar to North American audiences than, say, the example of Mondragon. For our readers who might be learning about these developments for the first time through Mark and Melissa’s excellent film, could you briefly outline the historical trajectory of cooperative business in Italy, and give us a sense of the contemporary size and scope of the cooperative sector in the Italian economy as a whole? John Duda: Could you speak specifically about the role that religion and politics have played in this historical experience, and how that impacts the current state of and prospects for the cooperative sector? Vera Zamagni: Italian cooperatives have never been politically and ideologically neutral. They were promoted in the 19th century by “apostles” that preached common economic action as part of a general vision of society not based on individualism and self-interest. Three were these visions: the first was a “humanitarian” vision, according to which peace and cooperation had to prevail among people. The other two were much stronger visions, capable of mobilizing the masses: the socialist-communist one and the Catholic one, born out of Pope Leo XIII famous encyclical letter Rerum Novarum (1891). As a result, multiple federations and umbrella organizations of cooperatives were created. Fascism in 1926 imposed one single umbrella organization controlled from above, but after the end of World War II and fascism, the three umbrella organizations in existence before the war were reorganized. At the same time, the new political parties which had been created decided to lend support to cooperativism by inserting in the new Constitution an article (45), in which the strategic role of cooperatives was recognized, and State support for cooperatives guaranteed. In the following years, the “collateralism” between each umbrella organization and one or more parties became established. The negative implications of this situation (mostly, fragmentation of the cooperative movement) were less than the positive ones, because strong communitarian ideologies increased the propensity of people to set up businesses that did not practice only self-interest and profit maximization and the umbrella organizations were encouraged to play a tight strategic role. With the disappearance of traditional parties in Italy across the 1990s, collateralism was no longer practiced, while the attenuation of ideologies decreased motivations to maintain the separation of the umbrella organizations, which in 2011 decided to set up a path towards integration. That is due to be accomplished in 2017. John Duda: The history of cooperatives in Italy after the Second World War involves some very interesting legislation that enables the formation of and investment in cooperative businesses—what are the most significant government policies that have really enabled the cooperative sector to grow? Vera Zamagni: One of the positive implications of having cooperatives mentioned in the Constitution was precisely the engagement by governments to pass laws supportive of cooperatives, especially as far as their capitalization was concerned. Straight after the introduction of article 45 in the Constitution, the first law appeared which defined the rules for coops (one head/one vote, open door, a minimum of nine members, a ban on members who had a private business in the same field, a ban on distribution of indivisible reserves, even in the event of liquidation of coops), and introduced the compulsory registration into a registry, which allowed coops to be eligible for the subsidies that the national or local governments would introduce (very limited at the beginning), and granted supervision of coops to their umbrella organizations, reserving to the Ministry of Labour the supervision of the coops which did not join any umbrella organization (something that was allowed). Nothing relevant happened for the next two decades, up until the 1971 bill, called the “small reform” (Law 127 17/2/1971), that recognized members’ loans as a crucial element to increase capital available to coops. This novelty had to be agreed upon with the Bank of Italy, because coops performed some of the role of banks, and implied a lighter taxation of deposits with coops compared with normal banks. The sector where members loans became more important was that of the consumers’ coops, given the very large number of members and the ease of depositing and withdrawing money by the part of members. As the history of Coop [the cooperatively owned Italian grocery chain] has shown, the substantial investments done in the eighties and nineties, which allowed Coop to become the Italian leader in retail distribution, were largely financed through members’ loans that covered more than half of the necessary funds. Even more important was the bill approved in 1977 that allowed undistributed profits set aside in indivisible reserves not to pay the corporate tax, a measure that increased self-financing considerably. Even more important was the bill approved in 1977 that allowed undistributed profits set aside in indivisible reserves to be exempt from corporate taxation, a measure that increased self-financing considerably. In March 1983 a new bill was passed (Law no. 72, labelled Visentini from the name of the minister Bruno Visentini who produced it), granting to cooperatives the permission to fully own or have a majority stake in a capitalist corporation. To be mentioned are other two laws: Law 381 of 1991 on social cooperatives, which aimed at recognizing the different nature of social coops, which were granted a multistakeholder board and serviced the local community rather than members alone (called “external mutuality”, a principle recognized by the International Cooperative Alliance in 1995 as the seventh principle of cooperation). 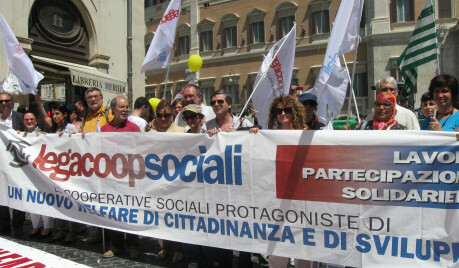 Another step in the direction of making available additional financial resources for cooperatives was made by Law 59m approved in 1992, which allowed cooperatives to have members who only supplied capitals (socio sovventore) and to issue special privileged shares (azioni a partecipazione cooperativa). Another important measure introduced by Law 59 was the obligation to devote 3% of the coops profits to a fund managed by each of the umbrella organizations aimed at strengthening the cooperative movement through the creation of new coops and the restructuring of some of the existing ones. Later governments, especially the Berlusconi’s ones, decreased the tax privileges of cooperatives substantially. John Duda: Mark and Melissa’s film focuses on cooperatives in the city of Bologna, in the heart of the Emilia Romagna region, where there is an extraordinary density of cooperative businesses. Can you talk a little bit about the history of cooperative development in the region? People were used to self-government and were not prepared to work for a boss. Vera Zamagni: Emilia-Romagna was one of the most advanced agricultural regions in Italy (together with that of Lombardy, a region that diversified into industry much before). The reason for lack of diversification was that Emilia-Romagna before unification hosted three states (two duchies and a part of the Papal state). The domestic market was therefore fragmented and cities were quite alive, but small, with excellent crafts traditions. This widespread city life on the small size marked the place for ever. When the region started industrializing, it was a widespread industrialization on the small size, with highly specialized SMEs. People were used to self-government and were not prepared to work for a boss. When it was not possible to run a small company, they much preferred to build a cooperative, in which there was no boss. This is the main reason for the diffusion of cooperativism in the region. An additional reason is the joint control of waters, because Emilia-Romagna borders with the largest Italian river, the Po, and hosts its estuary, with an area towards the Adriatic sea that is lower than the sea level. Strong political and ideological movements (socialist-communist and catholic) have increased the strength of cooperation, leading up to the building of most of the largest Italian cooperatives in Italy. Italy’s large and effective cooperative federations also include social cooperatives, which work to deliver services to communities rather than producing for the market. John Duda: There seems to be an interesting distribution of cooperatives across the sectors of the Italian economy—can you speak to the factors that seem to promote the success of certain types of co-ops (consumer, worker, producer) in certain specific areas of economic activity? And why do we see so few worker cooperatives in manufacturing? Vera Zamagni: This is a topic I have addressed in a specific article of mine, “Interpreting the roles and economic importance of cooperative enterprises in a historical perspective”, in JEOD, 2012 , I, pp. 21-36. Users coops. This type of coop is created by people who use the product/service of their cooperative and can be found in retail trade, utilities, credit, insurance, and housing. Members appoint managers to organize the business on their behalf, using dependent workers. Capital is advanced by members, who need not make a large individual contribution (because generally there is a large number of members). The cooperatives can get the goods and services at the best price, avoiding a costly intermediation, beside receiving the surplus under the form of rebate. In addition, these cooperatives can carry on specific campaigns in favor of targets members want to reach (fair trade, clean environment, microcredit, co-housing, etc.). There is little doubt that this is the most successful type of cooperative. Its advantage lies in cutting intermediation costs and making the service concerned available to small and scattered users at the best possible conditions, responding to the needs and preferences of users—rather than to the profit maximizing desires of capital owners. Capital can be collected by multiplying the number of members of such coops, which can easily reach the tens or hundreds of thousands. Additional capital can be made available through members’ loans. Producers coops. This type of coop is formed by members who produce in a private company of their own something which is conferred to a coop in charge of buying inputs, marketing, and often processing the output. The best example is given by farmers coops, which increase the market power of farmers contrasting monopsonies, and internalize the profits produced by the processing of the produce in dairy plants, wineries, oil mills, canneries etc. owned by coops, although often incorporated as joint stock companies. A special version of producers coops are retailers coops. Originally, retailers maintained their direct activity as shopkeepers (as farmers do), but cooperated in wholesale purchases and in many other services. When hypermarkets appeared, however, retailers coops became a rather blurred type of coop, because retailers shared a capital stake in hypermarkets, some of them giving up their shopkeeper activity altogether. The reasons for success of cooperation in this field are clear: to increase the market power of farmers (and shopkeepers), while leaving farmers free to directly conduct their activity. There is a strong interest by the part of producers, generally small and scattered, to avoid being exploited by wholesale buyers, to reap the benefits of economies of scale in the purchase of inputs and machinery, and to be able to internalize the profits of the industrial processing of their produce. The capitals needed to start business are not large and can be accumulated as the business grows up. The tendency of these coops to become large is well established, especially if they deal with highly standardized commodities. The important role these coops can play in supporting the income of farmers is so established that governments are often inclined to commit the management of the bulk of their agricultural sectors to cooperatives, as the cases of India and Japan show. However, if cooperation remains confined only to agriculture proper, mechanization, the shrinking of the labour force, and the increased size of farms tend to lock farmer cooperatives into a marginal business. The food industry, then, is the one granting better prospects to farmers cooperatives of having a lasting place in national economies. Agro-industrial cooperatives are prospering in the world, both in the advanced and in developing countries. ICA created already in 1951 a specialized committee (the ICAO, International Co-operative Agricultural Organization), that holds an annual meeting. Among the 300 largest world coops (Global 300 survey of ICA for 2008) they are 110, boosted by the large number of American (23) and French (21) coops. Social coops. These coops are formed to deliver personal services to the local communities, and to create opportunities to work for handicapped people. The comparative advantage of coops in social services is mostly based on intrinsic motivations. The fact that social services postulate a direct contact of the producer with the clients—interpersonal relations—makes the personal involvement of the producer much more essential to the good result of the process. Having “intrinsic motivations”, sometimes a true passion, for what the social service worker does is the best prerequisite to have a satisfactory relation with clients. Coop members, who choose to be in a social service firm run by them, are in the best position to develop their talents and express their “benevolence” towards their colleagues and clients, ready to tailor their services to the real needs of clients. Social service coops are normally not large, precisely because of the need of customization, and rely more than other types of coops on networks. Physical capital needed is often modest, while human capital is extremely important. Workers coops. These are the coops where workers are suppliers of capital and participate directly into management. Workers coops in industry are not so diffused, for a host of reasons, among which the most important are the following: standardization of products and Fordist processes of production in industry; the huge physical capital needed; and the large economies of scale which need to be reaped. Workers at the assembly line have to perform menial jobs, in which there is very little scope for the exercise of personal talents. The huge corporations needed by the economies of scale can only be governed through tough hierarchies and there is certainly no scope for “democratic” management. What predominates in these corporations is capital, and managers are seen as instruments to serve capital, hence “capitalism”, a truly expressive word. Workers coops can be more successful in services, where standardization is less important, size of companies smaller, economies of scale less pronounced. John Duda: One of the most exciting areas of development for Italian cooperatives has been in the social economy, which I think is going to be one of the most unexpected takeaways for US viewers of Mark and Melissas’s film, even those familiar with cooperative business more generally. Can you explain how democratic enterprises are being used to deliver social services in the Italian context? What are the advantages for workers? And for the recipients of these services? Vera Zamagni: Social cooperatives have become extremely welcome in Italy for a host of reasons. The first is that Italy has a tradition which goes back to the Middle Ages of creating and running communitarian not-for-profit agencies in the field of welfare (hospitals, institutions called “conservatories” in which old people, orphans, youngsters who needed apprenticeship of some kind were hosted and looked after), plus pawn banks. The financial crisis of the welfare state has added another reason: bureaucratic production of welfare services had a high cost and a low quality. Civil society in Italy is quite strong and the first examples of social cooperatives were produced directly by people, unsatisfied with the supply of care services by local authorities. The State only stepped in with legislation later on, as I have explained above. The model became very widespread because the satisfaction of the recipients of services is high, the cost to the public authorities is lower than using bureaucracy, and the intrinsic motivations of workers is high. These workers are often highly creative people, who supply social services in innovative ways. John Duda: Can you talk about the process of connecting and scaling cooperatives in Italy? Which co-ops have been able to achieve significant scale, and why? And how have networks and other kinds of associations between cooperatives provided alternative ways to achieve larger impacts? What are the most successful strategies and challenges you see for cooperatives that are operating at larger scales? Vera Zamagni: This is another topic I have specifically addressed with a collaborator of mine in V. Zamagni, T. Menzani, Cooperative networks in the Italian economy, in “Enterprise and Society”, XI, march 2010, no.1, pp. 98-127. Networking is the alternative to full integration, to reap economies of scale and scope. If and when mergers and the building up of a single integrated firm is not acceptable either on technical grounds (need for specialization) or on cultural ones (no propensity to work in a big business), networks can provide the necessary cuts in transactions costs. The Italian cooperative movement has been able to form horizontal, vertical, complementary networks through consortia and groupings, supported by financial networks and the strategic role of umbrella organizations, as it can be read in the article quoted above. Networking is the alternative to full integration, to reap economies of scale and scope. John Duda: Many people were dismayed to see one of the largest cooperatives in Mondragon, Fagor, close its doors due to the combination of global competition and a depressed local market. What kinds of pressures and tensions impact the Italian cooperative sector as a result of the globalized capitalist economy? Which cooperatives in Italy are best able to push back against these kind of market-driven imperatives, and how? Vera Zamagni: The case of Fagor strengthens what I have already said above about the difficulty of having cooperative companies in the manufacturing sector. Indeed the few Italian successful ones are highly specialized middle size companies internationally competitive. But in general manufacturing today needs huge multinational corporations that the cooperative movement cannot produce. My vision is that there is no single optimal form of corporations, but a plurality. The comparative advantages of the cooperative form have been specified above. In my opinion, the cooperative form of enterprise cannot boast comparative advantages in all sectors of business; what I claim, however, is that neither can the capitalist corporation. The latter’s comparative advantage is mostly in highly capital intensive and standardized business lines. John Duda: As we try to imagine a “next system,” capable of guaranteeing more equitable and more sustainable outcomes than the current one, what is the role you see for cooperatives? How does taking cooperatives and cooperation seriously challenge the current assumptions of economic thinking? And what can we learn specifically from the Italian experience that can help inform the design of systemic alternatives? Vera Zamagni: Following on what I was anticipating in my previous answer, my view is that there is a plurality of forms of enterprises, and no one of them is optimal under all conditions, but each form should be used in an appropriate context. Cooperatives do their best in services that have a high content of relations, or in sectors of production that rely heavily on traditions and differentiation, or in sectors were ownership is fragmented and the processing of the products must be joint (typically agriculture), or in utilities. To this I have to add that cooperatives tend to humanize the market because of their rules of functioning: the person – the member – is at the centre, not capital. And their presence will therefore tend to push capitalist enterprises too to give more attention to the welfare of their workers and their customers. …cooperatives tend to humanize the market because of their rules of functioning: the person – the member – is at the centre, not capital.